Located on the North-Western tip of Africa, the Kingdom of Morocco offers more than what meets the eye. Characterized by rugged mountain ranges and vast deserts and a lengthy coastline along the Atlantic Ocean and Mediterranean Sea, this country gives you the best of all terrains. With some popular cities like Casablanca, Marrakesh and Tangier with their scenic beaches and historical locations, this exotic travel destination is also advertised to be pocket friendly. The journey through the tiny villages, vast deserts and towering mountains while witnessing the confluence of the Arab and African cultures is what makes you fall in love with this country. The beautiful rooftops of Tangier make you fall in love with this European-style city. Those who’ve watched Bourne Supremacy would remember Matt Damon jumping off the roofs and biking across the winding lanes of the town; walking through the lanes of this town or seeing the rooftops is sure to bring back those scenes. 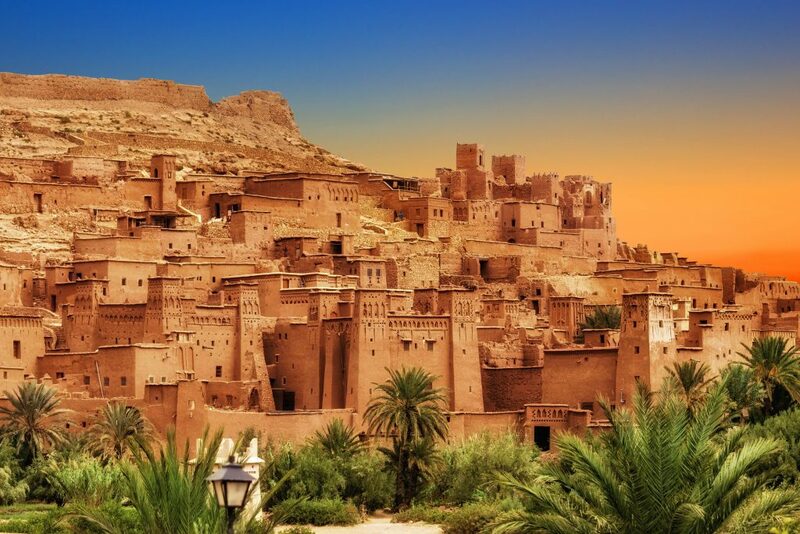 The beautiful Kasbah and Dar el-Makhzem Palace are sites to witness 17th century Moroccan architecture and craft-work. Relaxing at the beach or strolling on the promenade with blue sky and clear waters around is a treat here. Ville Nouvelle is the area to head to for some intricate 19th and 20th century architecture along with Terrasse des Paresseux, where you can enjoy the eye-catching view of the ocean and southern Spain. The largest city in the country, Casablanca, is the main gateway to the country for most visitors and is a flourishing city. This modernized city is different from the others and yet has a historic side to it that must be explored. One of the largest mosques in the world, Hassan II Mosque dominates the Medina’s skyline and tours to the large prayer halls and courtyards with their intricate decorations is a must-do thing when visiting Casablanca. Walking through the old city is a great way to get a residential feel of the Casablanca life while the picture perfect Place Mohamed V is the place to be for promenading during the evenings and is home to the most important official buildings of the city. Sitting by the corniche and seeing the waves lash on the walls and relaxing on the public beach is the best way to unwind here. Built in 1930s, the Cathedral du Sacre Coeur is a blend of European and Moroccan architecture and gives you a glimpse into its past glory. Shopping in the bustling Central Market is a must for all tourists, this is the place you’ll see the day-to-day life of locals unfolding in front of you and the famous Moroccan slippers are also available here in a plethora of colors. The Oudaias Kasbah neighborhood in Rabat with its white and blue houses with their flower pots bounding the tiny winding lanes gives you vibes of Santorini and is the prettiest area in the capital. Fes el Bali is a big cultural destination and the alleys here turn around in manner that it’s easy to get lost, while the large tanneries are a popular destination for those who can handle the smell here. The picturesque town of Chefchaouen at the foot of the Rif Mountains is a paradise for photographers with its blue-on-blue buildings and the magnificent mountains in the backdrop. Morocco even has some traces of Roman Empire and this can be witnessed in the Volubilis ruins. The site is filled with remains of ancient temples and broken columns, all located on the hilltop. The 2500km long Atlas Mountains pass through Morocco and the highest peak, Jebel Toubkal is present in the southwestern region of the country; climbing to the pinnacle of this ice capped peak is an adrenaline filled experience for all adventure seekers. How can a trip to Morocco be complete without visiting the great deserts of the country? Erg Chebbi is THE place to head over to for some dune-surfing, four wheel drive dune bashing and the traditional camel trekking. Sitting among the dunes and enjoying the fine sand getting blown away by wind is truly a one-of-a-kind experience. A miniature Grand Canyon experience awaits you at Todgha Gorge, which is nearly 24km long. The last 600 meters of the gorge are as narrow as 10 meters and have walls rising to the height of 160 meters on each side and this is a popular spot for all adventure seekers looking to climb the rocks here. Unlike what is popularly known, Morocco has a lot more to offer than just the main cities of Casablanca, Marrakesh, Rabat and Tangier, and these hidden gems of the country are what make every tour fulfilling and give the true Moroccan experience; this tip of the African continent is truly filled with magical wonders.